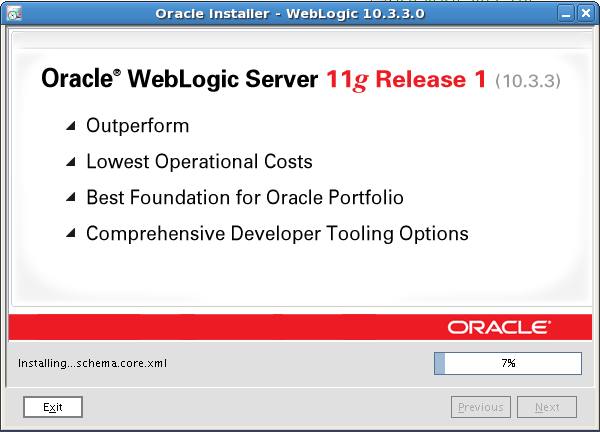 This documents will detail the installation of Oracle Weblogic Server 11g Release 1 (10.3.3.0) on Oracle Enterprise Linux 5.5. 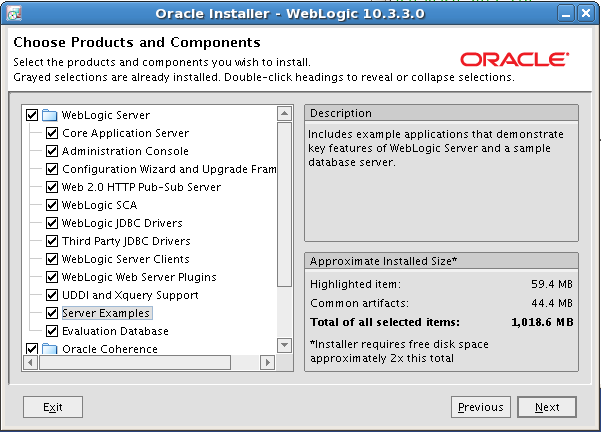 The 32bit version of Oracle Weblogic Server was used in this installation. 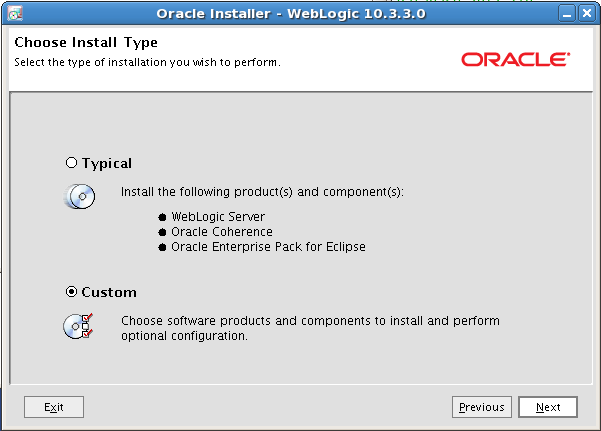 Note: If you are installing Weblogic as a requirement for Oracle Enterprise Manager 11gR1 Grid Control you will need to use Weblogic 10.3.2. See Oracle Support Note: 1135493.1. 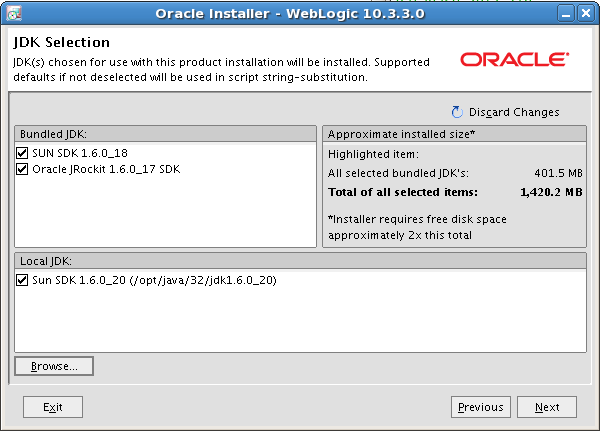 Start the installation by executing wls1033_oepe111150_linux32.bin. The first screen is the Welcome screen. Click the next button to continue. On the Choose Middleware Home Directory either type in or Browse to the location in which you wish to use as the Middleware home. Click the Next button to continue. 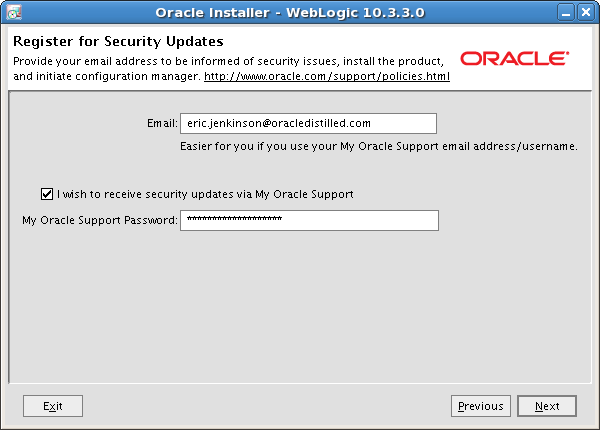 On the Register for Security Updates screen enter your My Oracle Support user name and password. This information is optional. Click the Next button to continue. You have the option of performing a typical or custom install. Click the Next button to continue. If you choose to perform a custom install you can choose the components to install. Below I selected to install the Server Examples. Click the Next button to continue. 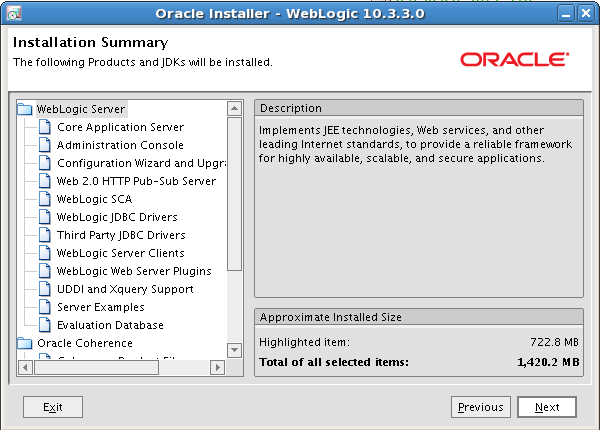 On the JDK Selection screen, browse to your local JDK installation. Click the Next button to continue. 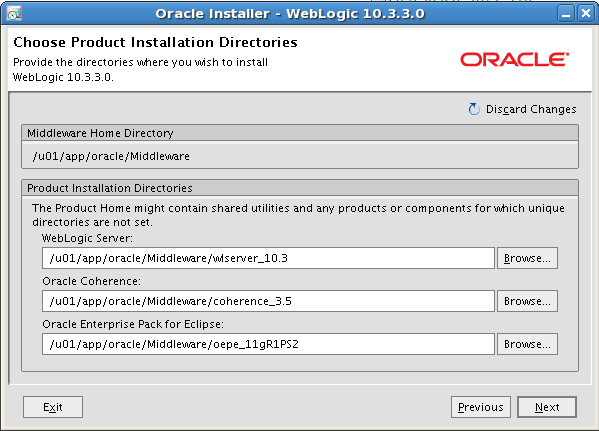 On the Choose Product Installation Directories screen you have the option of changing the location of the Weblogic Server, Oracle Coherence and the Oracle Enterprise Pack for Eclipse. 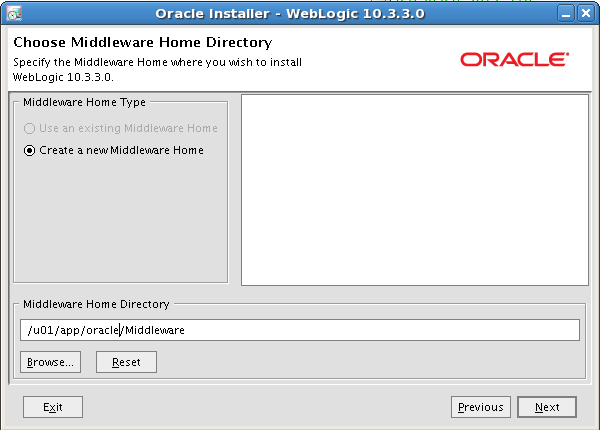 By default each product is created in the Middleware Home Directory. Click the Next button to continue. The Installation Summary page lists all of the item that will be installed. This is also the last chance you will have to make any changes before the installation starts. Click the Previous button to go back and make any changes or Click the Next button to continue. 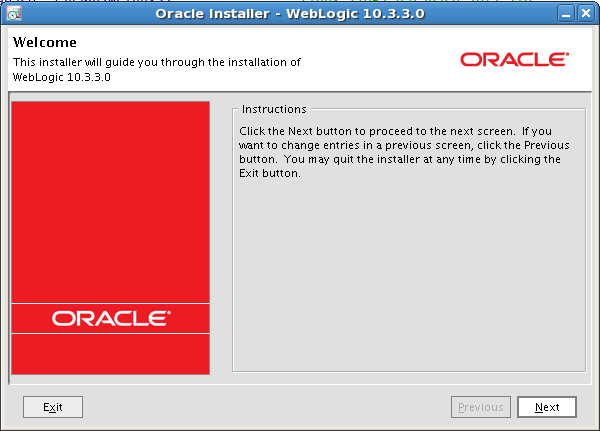 After clicking the Next button the installation begins. 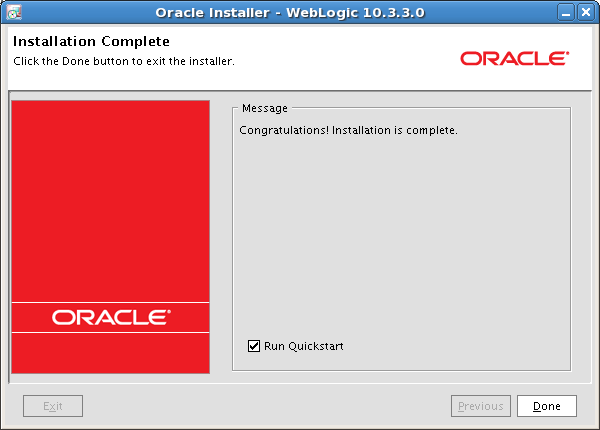 Once installation is complete click the Done button exit the installer. Note that the checkbox is selected and if left checked the Quickstart will run. 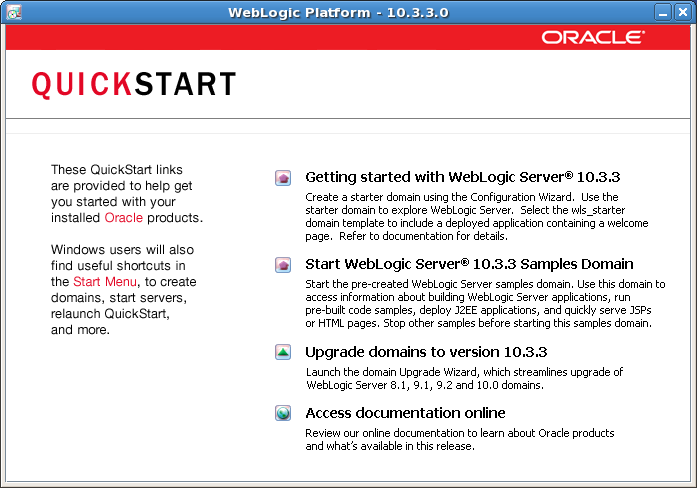 The Quickstart provides links to get started using Weblogic quickly. If you choose not run the Quickstart at the end of the installation you can run it later at MIDDLEWARE_HOME/utils/quickstart/quickstart.sh.